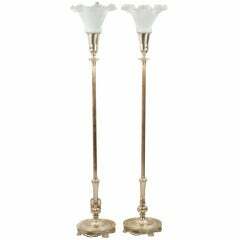 A pair of Art Deco floor lamps with organic, trumpet-shaped brass shades with piercings that allow the addition of Lucite fins to illuminate. 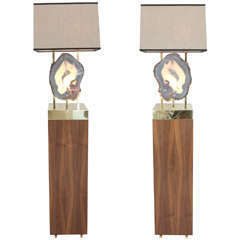 Materials: spun aluminum with brass components and Lucite. Model number C5043 engraved at the bottom of the base. 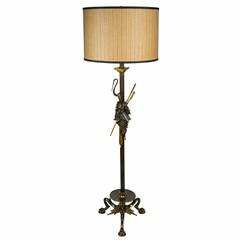 It appears at some point in the life of these lamps the scocket may have been changed on one of the lamps resulting in a brass plug and relocation of the knob, doesn&rsquo;t detract from the overall design. 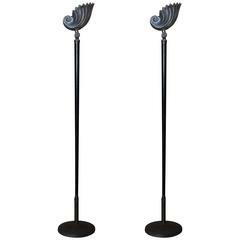 This pair of metal floor lamps from the 1930's have elegant decorative elements throughout with five candle holder lights. 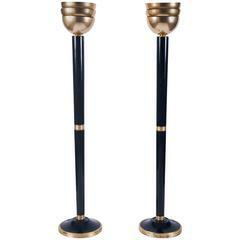 A pair of Art Deco brass floor lamps. Newly rewired. 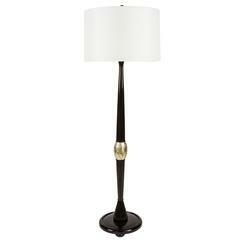 Pair of Art Deco style ebonized and giltwood turned floor lamps each having three tiered brass shades. 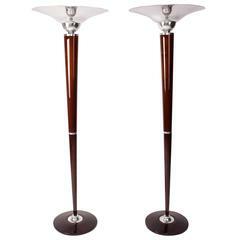 Pair of Art Deco torchiere floor lamps. 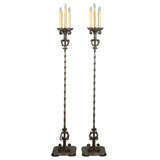 A pair of 1950s Art Deco style aluminium and brass standard lamps. 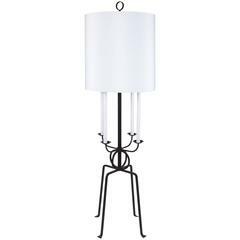 Mounted on ebonized bases. Re-wired.